My random comic pick on The Comic Conspiracy: Episode 63 is "The New 52" title DC Universe Presents: Vandal Savage written by James Robinson with art by Bernard Chang. 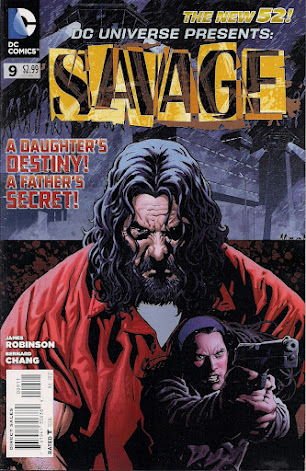 The story is intense, and in the vein of Silence of the Lambs, but with Vandal Savage as the homicidal killer that helps his own daughter find the copycat murderer who is out there somewhere reeking havoc in the Vandal Savage way. A must read. I can understand why some people would shy away from a title like DC Universe Presents. It is an ongoing collection of mini's about random characters in the DC Universe, and this is also exactly why you should be picking up this title. Vandal Savage is the third story arc to come out of this series, and besides the Challengers of the Unknown three issue hiccup, I would say that it has been an amazing title. The first run in DC Universe Presents was about Deadman, and it is worth a read. You can collect the whole series, but you don't need to. Just follow who is being presented, or the writer, or the artist, and if you can't stay on the stories are short enough that in a few months you can always jump back on with the next random character, writer or artist, and give something new a try. Remember you can download digital comics at our Comics Conspiracy - Comixology Storefront or you can order comics from us directly by visiting the shop, giving us a call (408) 245-6275, or dropping Ryan an email at ryan@comicsconspiracy.biz. DC Needs To Hire This Guy!